Heroes, Heroines, and History: Myths of Medieval Armor PLUS GIVEAWAY! Myths of Medieval Armor PLUS GIVEAWAY! Your night in shining armor? Maybe not. I recently had the opportunity to listen to Dirk Breiding an Assistant Curator and Armor expert of the Armor Gallery of Metropolitan Museum of Art. The information shared over that hour was so fascinating and great at debunking armor misconceptions that I had to share it. Because the further you go back in time the less documentations survive and also the less objects that survive. There are actually very few experts in the field of Armor, which also adds to much of the problems of misconceptions. 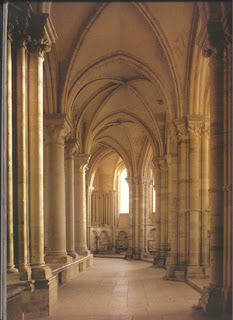 There are very few items that have survived in the true medieval time period (15th century and earlier). To add to that there are very few people who have handled true pieces of armor and their weapons. What does survive are the stories. There is the hero, the damsel in distress, the hero's horse and romance. These are at the bases of the misconceptions. 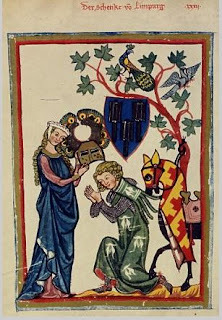 What is the first thing you think of when someone mentions a knight or damsel in distress or just medieval times? Is your first thought 'A Knight in Shining Armor?' According to Dirk Breiding that is the first misconception. Why do you ask? Well, when we hear of the age of chivalery it is actually the 13th and 14th centuries. During this time armor wasn't really that shiny at all other than possibly the helmets. The rest of the armor was made of mail. These small interlinking rings don't really make up for shiny armor. 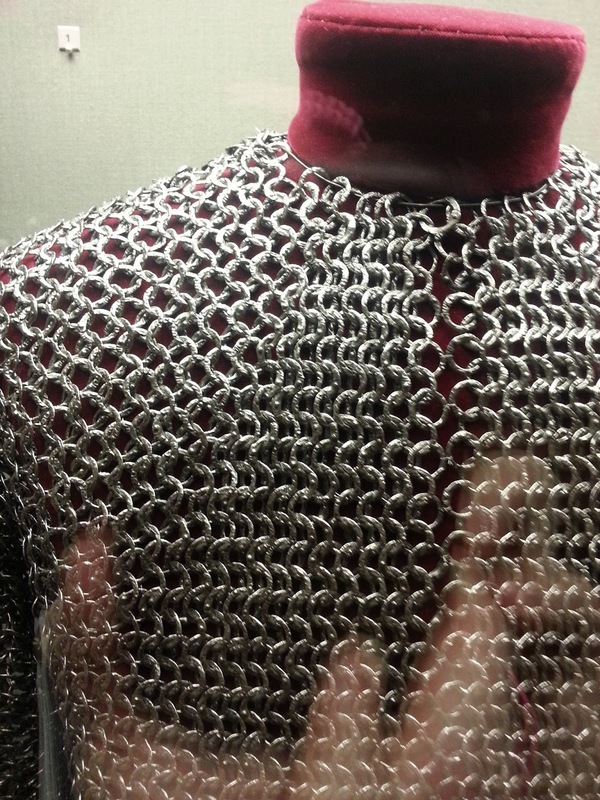 Just for a little extra debunking mail was never called chainmail. Another misconception of armor is that only knights wore it. That actually is far from the truth. A 17th century stained glass from the Strasbourg Cathedral shows coopers (barrel makers), armorers, cutlers, and smiths walking alongside the knights who were riding their horses, all in armor, headed to battle. There were men of many different trades and not knights that lived in big cities that were required to own armor and weapons to defend the city in times of war. Another misconception is that the armor was extremely heavy, about 100 pounds. I have to admit that in my online research and even some book research that I too believed this was correct but as it turns out, armor weighed about 60 pounds. That is close to what our troops today are required to haul around with all their equipment and backpacks. And because of that misconception another one was formed. 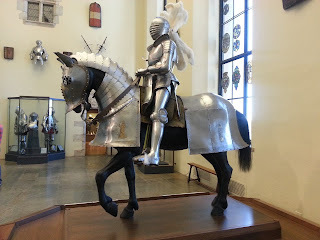 The assistant curator partly blames this one on Mark Twain poking fun in his book A Yankee Knight in King Arthur's Court where Twain talks about how hard it is too get around with armor on and to get on your horse. A screen play from the 19th century, When Knights were Bold also makes fun of Knights getting on their horses and moving around. People latched onto this idea and by 1944 when Sir Laurence Olivier played Henry V he went against his 2 armor experts who advised him not to do the scene where they showed him being hoisted onto his horse. So how did one get on his horse. Interestingly enough the same way I do. He put one hand on the saddle, one foot in the stirrup and swung up in it. 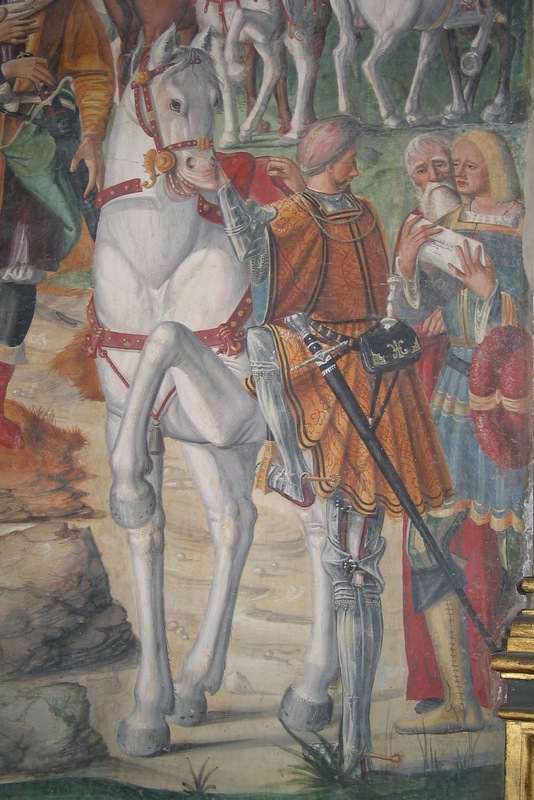 There are pictures starting from the 12th century on up into the 16th century that portray knights mounting their horses this way. 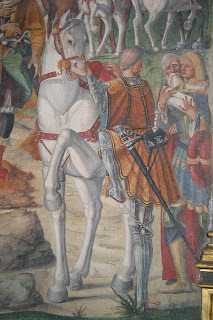 In some pictures they show someone holding the saddle. I'm guessing to keep it from slipping off to the side as they put all that weight in the stirrup. 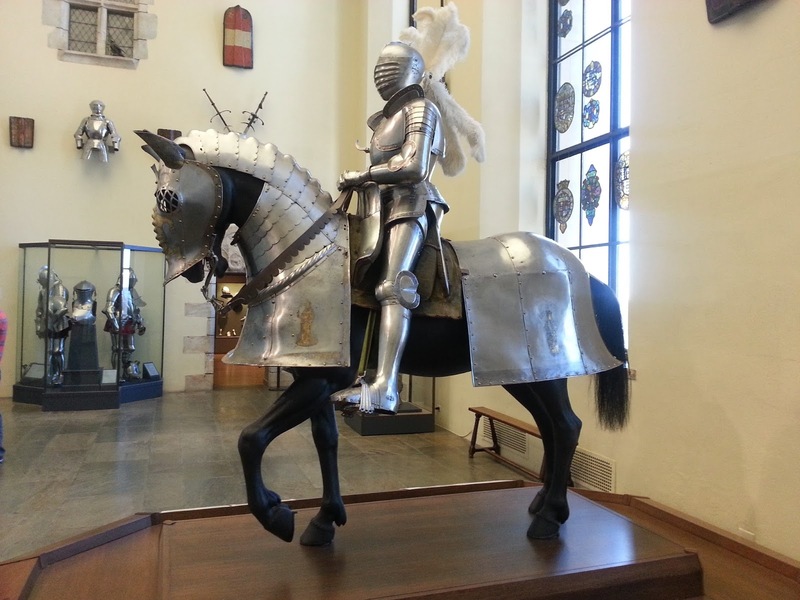 What was really fascinating about this curator's video is that they had come by some real armor that had been badly restored so one of the employees put the armor on and showed how easy it was to mount a horse. They also show a sword fight, lounging on the ground and getting up. All movement was really quite easy. He also mentioned that in the Marshal of France autobiography (from the 15th century) he tells how he could do cartwheels, jump over his horse, do somersaults, jump into the saddle of his horse, and he climbed on the underside of a ladder using just his arms. The Met museum showed a picture of one of their employees doing a cartwheel in full armor! Mr. Breiding mentions that we sometimes think of these people as not being inferior and less intelligent than us. He also brings up the point that these are the same people that built buildings that are so well built that hundreds of years later they are still standing and they are so breathtaking people travel from all over the world to see them because they are a work of art. These are the same people that invented the eye glasses and built ships to sail on the ocean. The armor that the medieval people made (he showed on this video) was nothing short of a well oiled piece of machinery. The foot piece he demonstrated moved better than any cowboy or work boot made out there today. If you'd like to watch the video yourself, here is the link. 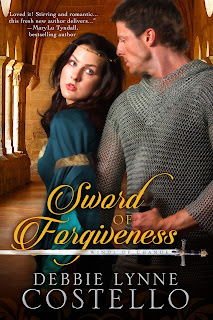 Leave a comment for a chance to win choice of one of my books in choice of format, including Sword of Forgiveness in audio. After the death of her cruel father, Brithwin is determined never again to live under the harsh rule of any man. Independent and resourceful, she longs to be left alone to manage her father’s estate. But she soon discovers a woman has few choices when the king decrees she is to marry Royce, the Lord of Rosen Craig. As if the unwelcome marriage isn’t enough, her new husband accuses her of murdering his family, and she is faced with a challenge of either proving her innocence or facing possible execution. Royce of Hawkwood returns home after setting down a rebellion to find his family brutally murdered. When all fingers point to his betrothed and attempts are made on his life, Royce must wade through murky waters to uncover the truth. Yet Brithwin’s wise and kind nature begin to break down the walls of his heart, and he soon finds himself in a race to discover who is behind the evil plot before Brithwin is the next victim. Debbie Lynne Costello has enjoyed writing stories since she was eight years old. She raised her family and then embarked on her own career of writing the stories that had been begging to be told. She and her husband have four children and live in upstate South Carolina. She has worked in many capacities in her church and is currently the Children's Director. Debbie Lynne has shown and raised Shetland Sheepdogs for eighteen years and still enjoys litters now and then. In their spare time, she and her husband take pleasure in camping and riding their Arabian and Tennessee Walking horses. It is nice to know the weight of the armor was not as heavy as we all believed it to be. Such an interesting post, I am fascinated with medieval times. Hey Lisa, I love that you are fascinated with medieval times. I am too! it is so interesting how they lived. And my goodness the buildings that were built in that time are amazing! I have always wondered how heavy the armor was in medieval times. Thank you for sharing this post, it's quite fascinating. Thank you, Cindy. I had always believed that it was heavy it was a bit humbling to find out I didn't have it right! Great post! It's amazing how uninformed we can be, making assumptions when we don't look for the facts. Not a big deal when you're thinking of armor, but what else have we "dumbed down" because of our modern bias? Thanks for the info! Connie, That is a great observation! You are so right. We make assumptions on things we really don't know and people put that out there as facts when it is not. Thanks for coming by. Hi Debbie Lynne. I am one of those people who thought that the armor was very heavy and I always considered the people who wore this armor to be exceptional people! Thanks for a very interesting post! Don't feel alone, Connie because I did too! And I did a LOT of research!! So it was really shocking to find out all that research was wrong! I often wondered about the weight of the armor so thank you for sharing this informative post. I've attended a couple Medieval Times events where dinner was served during all the acting. A nice experience and fun. I miss the Medieval times of old! The ones around here are medieval/fantasy and they are just so weird that I don't enjoy them like I did. Thanks for coming by, Marilyn. Oh wow. What a great talk. I'm itching to mention that another oft forgotten fact is that most armour was not worn directly on top of skin or over clothing. 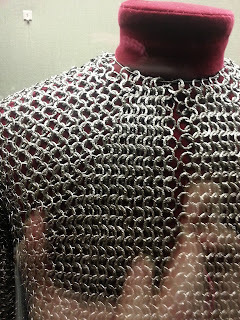 Usually, some kind of padded coat was worn underneath, helping to absorb the shock of blows and to ensure that the rings would not penetrate the skin if a sword cut through it. 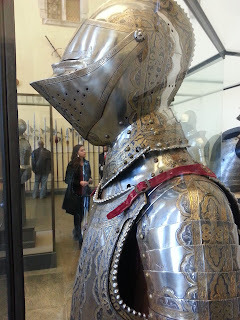 From what I've heard the idea that armour was really heavy does owe itself to fiction in part. But it might also originate from some of the decorative and elaborate but absurdly impractical suits of armour that became fashionable for tournaments and jousts carried out for entertainment. That was not the type of thing that would have been worn in battle, it was just showing off. Hey English Lady, yes they wore padding and the name of it slips my mind at the moment. But I talked about it in my first medieval, Sword of Forgiveness. Royce wore it under his armor. Gambeston? Some people say that they were made in the same way as modern bullet or stab prooof body armour. I'm sure you did mention it, I just don't remember a lot of details with stuff I read, because I read too much in a short space of time. It gets hazy. LOL! I so understand that! I have a very hard time remember things I've read. Even in my research! I often write things down if it information I will continue to need. That way I can just jump over and reread it. Especially in this sequel to SOF. A lot of history with Richard and Henry. I am constantly having to check my facts. Hey Lori! I hope you enjoy, Sword of Forgiveness! And like you, I want to keep the medieval time that romantic time of damsel in distress and Knight in shining armor. Thanks for stopping by! So interesting! I definitely thought armor was hard to move around in, haha. :) Thanks for sharing the facts! Hey Kiersti! Yes, I did too. It was fascinating to hear how they did somersaults in armor! I really enjoyed your article. It did clear up issues. Thanx for the giveaway!!! Thank you, Jennifer! I'm glad it helped clear some things up for you. Good luck in the giveaway. Also, I didn't know mail was never called "chainmail." Must be something we invented for clarity in our modern language. Cool article. I am officially debunked and off to see the video. Hahaha Cara! That is funny. You'll enjoy the video. I found it fascinating. This is such a great site! I live in Upstate SC too. I see in your bio you have Tennessee Walking horses. We had a solid black one that came with a 6-month old when we got her and she was pregnant. They all turned out to be some of the most beautiful horses I've ever seen. Hey Linda! We live in York County. What county to do live in? And yes we have TWH. I bet your black is gorgeous! Do you ride? So sorry I'm just now seeing this. I had to make a new e-mail account to follow authors in Gmail and am still learning how to use it. Thanks for responding back to me. I live in Anderson County. I can't ride due to physical disabilities, but they are beautiful just to sit and watch. My daughter is the rider. 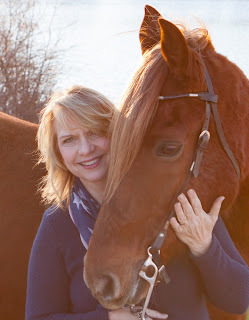 She is a barrel racer and is very interested in therapeutic horseback riding. Blogs can be so touchy sometimes! One of my sons attends Pharmacy School in Clinton, SC. I believe that is in Anderson County. I love to watch barrel racing. It looks like so much fun! Thanks, Caryl! Keep us in your prayers with this hurricane. So many misconceptions about medieval times. Thanks for setting the record straight. Great posting. Hey Debbie. I understand how easy it is to get things wrong because we just don't have the documentation from that period so it is really nice to find some solid information! Wow - I had so many misconceptions about medieval armor. Thank you for posting this interesting information! You're Welcome Linda! I'm so glad you enjoyed it. I loved researching this one! I did not know a non knight had to buy his own armor. Very surprising . Excellent article. Hey Jon, That was new information to me, also. But it does make a lot of sense that men not knighted also fought to defend their land. I am SURE someone has researched that. I wouldn't be surprised if Mythbuster has. Fascinating information on Knights and their armor! You always have such interesting posts! Thanks! Congratulations, Quilting lady! You are the winner! I'll be contacting you shortly.